Summary Cloud-based security camera system with speaker, microphone and air quality/humidity/temp sensors. Given the number of cloud-based IP cameras, there must be a reasonable market for them. However, as I look at products like NETGEAR's Arlo [reviewed], Nest Cam and others, I tend to wonder if people know what they are missing. Cloud-based solutions seem great for checking on the cat in the middle of the day. But they all seem to be lacking key security camera features like adjustable motion detection sensitivity and zone control and pre-trigger event capture. I feel all these are key, and all seem to be missing from the many cloud-based cams. That said, today we're going to be looking at Canary. It's a home monitoring system that was initiallty crowd-funded on Indiegogo. It should be noted that Canary raised $1,961,663 on a $100,000 goal! It's a little different than other security cameras with geofencing support, air quality/temp/humidity sensors and the ability to learn from its motion-detection mistakes. Sounds pretty cool, so let's take a look. We were low on Canary's reviewer list, so I purchased mine at BestBuy. I'll be returning it and didn't want to take it apart, so relied on web searches and the FCC ID pictures to get a look inside. Information on the web was scarce and the FCC pictures weren't too revealing. The photo below shows the top side of the Canary board, but you can't make out much about the components used. 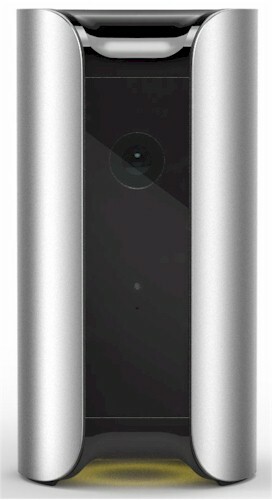 Canary's specs the camera at 1080p HD, although videos from the camera downloaded at 1280x720 resolution. The camera connects by either 2.4 GHz N150 class Wi-Fi or 10/100 Mbps Ethernet. Inside the box, you get a microUSB cable, wall-wart USB charger, the Canary and a setup audio cable (more on this shortly). Included on the camera is a speaker (for sounding a loud siren), microphone and air quality/temp/humidity sensors. The sensors are an interesting inclusion and one would think integration with Nest or ecobee as a remote sensor is an obvious next step. I honestly wouldn't count on integration with Nest anytime soon however, since they have Dropcam (now Nest Cam). I collected all the information I could gather about Canary specs into Table 1 below.